The first moment a virus infects a cell it has to deal with multiple cellular defenses. From surviving highly acidic conditions in endosomes to evading the host enzymes that can digest its very genetic code, an invading virus must navigate and eventually subvert the functions of a host cell. This intricate molecular dance has played out time and again for millions of years and modern science is just beginning to understand and appreciate the intricacy of these steps. A recent paper published in Nature Immunology suggests that there may be even more steps in the virus-host dance than we had imagined. Outside of science fiction, I would have dismissed this mechanism until I read the paper “RNA-mediated interference and reverst transcription control the persistence of RNA viruses in the insect model Drosophila” by Goic and others (1). Keep reading to find out more about this new exciting mechanism of viral defense. In Goic’s recent paper in Nature Immunology, they demonstrated that endogenous retroviruses (I’ve written about these previously here) in the model organism Drosophila (a fruit fly) can produce the reverse transcriptase protein. While this alone is interesting, what happens next is bizarre. 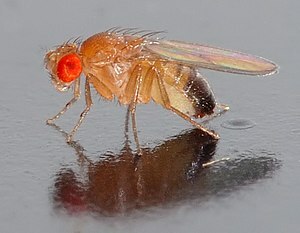 When these Drosophila cells are infected with an RNA virus such as Flockhouse virus (FHV), the reverse transcriptase protein can make a DNA copy of the viral RNA and then insert it into the host genome. These locations were mostly inside of long-terminal repeat (LTR) retrotransposons. This allows the host to produce viral RNA from its own DNA copy that can then be used to generate small interfering RNA (siRNA) that can be used by host RNAi (RNA interference) machinery to target and destroy viral nucleic acids. But what does this mechanism actually mean for an infected host? 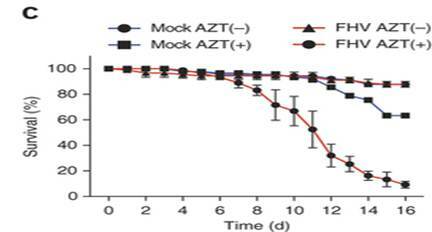 In their fruit fly model, they were able to show that when you blocked the function of reverse transcriptase with azidothymidine triphosphate (AZT, an anti-HIV drug), host cells could not control FHV infection and the fly would die. (See figure 5C below). However, in those that could make DNA copies of the virus so that they could mount an RNAi response, it was observed that the flies survived as well as uninfected flies. Based on their data, they proposed the following model. Once the initial infection occurs, ongoing viral replication can be limited in two ways: through the death of the cell, or by an antiviral RNAi response from the host cell. 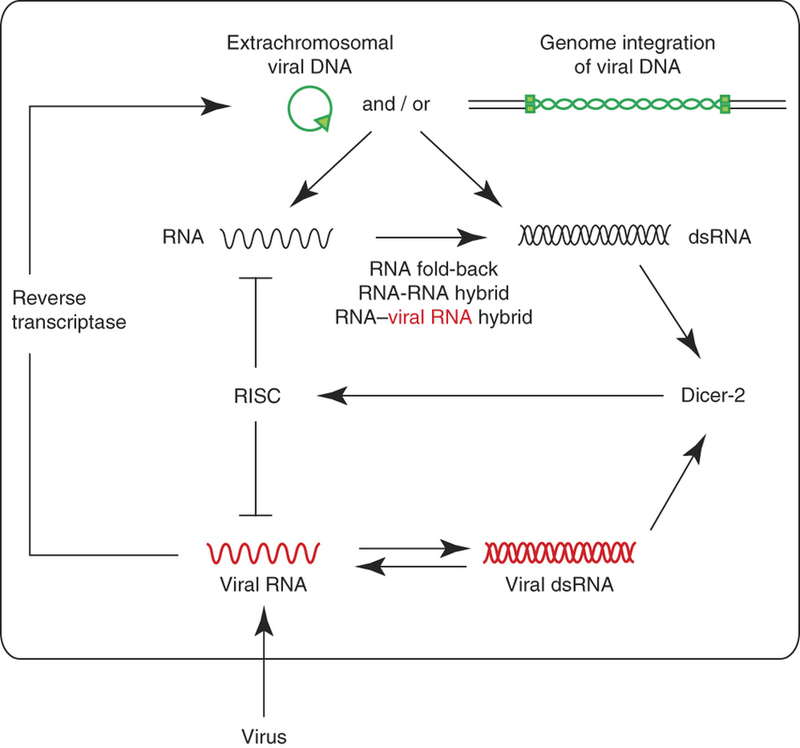 During this latter process, viral RNA gets copied into cDNA by reverse transcriptase, shuttled to the nucleus, and integrated into the host genome (or possibly in a circular, extragenomic form; the research could not determine what form the DNA took in the cell). Whatever form it takes, this resulting viral DNA is transcribed to produce a dsRNA form, which is then utilized by the RNAi machinery in order to combat the viral infection. By utilizing this mechanism, cells can reach a state of persistent infection rather than succumbing to unrestricted viral infection and cellular death. I never would have imagined that the host could endogenize a virus in order to acquire a level of immunity. Normally, this kind of thing is regarded as a very rare event, as we’ve mostly looked at germline integration of viral sequences which are heritable and impact the evolution of a species, which is in itself a very rare event. However, this paper poses the exciting suggestion that somatic cells (those that make up the bulk of our bodies) can actually use the endogenization of reverse-transcribed viral DNA in order to combat infection. While their work took place in fruit flies, there is the remote possibility that this mechanism is at play in our very own cells as well; as a large part of our own genome is comprised of these fossilized retroelements. I’ve always wondered why we keep so much genetic baggage in terms of excess genetic code that we don’t seem to use. This study suggests that what was once considered to be junk DNA may actually have an important function, at least in fruit flies. Whether or not this phenomena happens in mammalian cells is unknown, and it is quite possible that this mechanism is unique to insects. While there is relatively little knowledge about this mechanism, it is exciting to think of the experiments that this unique discovery will lead to in the future. 1. Goic, B. et al. RNA-mediated interference and reverse transcription control the persistence of RNA viruses in the insect model Drosophila. Nature immunology 14, 396–403 (2013).